The loss of a parent is devastating at any age, and can be a particularly traumatic time for a young child. Hazel and June Taphouse were just four and two years old respectively when their father Korey was struck and killed by a hit and run driver back in November 2016. Following their loss, the girls’ mother Emily Taphouse decided to move the grieving family closer to the city of Grand Rapids in Michigan; hoping to give her young children a new start. After the move, Emily, Hazel and June welcomed an adorable new addition to the family, in the form of adorable bulldog puppy Fern. Fern’s presence was a much needed ray of sunshine in the lives of the Taphouse family, and heartbroken Emily took great pleasure in watching her daughters play with the puppy. It’s like I could feel a patch be placed on my heart. I watched as my girls squealed and played and loved on her. She changed everything. And the love brought by Fern was only the beginning. Realising Fern was in need of some canine companionship, Emily set about looking for a furry friend to keep her company. 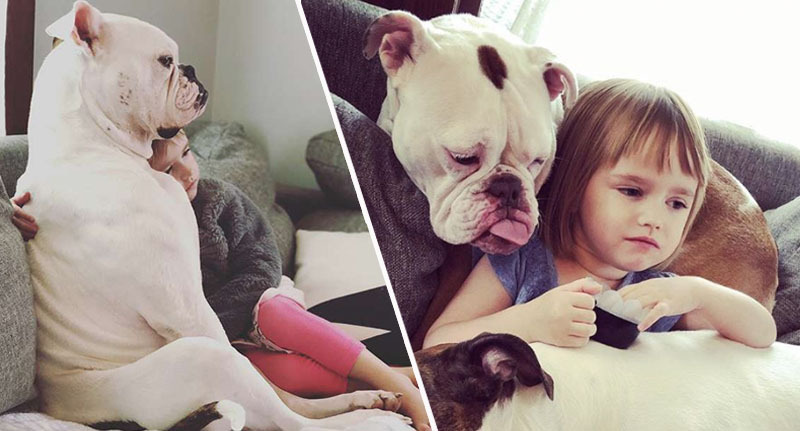 The Taphouse family soon welcomed five-year-old Juno into their midst, a gorgeous rescue bulldog who Emily has described as having ‘the happiest tail we have ever met’. Before being rescued, poor Juno had been abused and neglected for the first four and a half years of her life, and yet had still managed to maintain her ‘trusting and loving’ nature. The Taphouses opened their hearts to gentle Juno, and she gave them an ocean of love in return. Juno and little June quickly formed a close friendship, with Emily describing the bond to The Dodo as ‘love at first sight’. The little girl and her dog became a source of comfort to each other, helping to heal the sadness in their respective pasts. June has always liked animals, but had never formed a real bond with one. Until Juno. They are inseparable. They watch TV together, play together, and are touching at any possible time. Sometimes I think they are communicating in their own way that we don’t understand. It’s the most beautiful and comforting thing. The healing friendship between the little girl and the gentle rescue dog has touched hearts across the world; with many people being able to relate to the pain of bereavement being eased by a beloved pet. We got a dog after my dad died when I was a kid , it is like she was an angel sent from heaven to help us through. No matter what a dog has been through they will always have the love to give. Dogs are so loving kind and understand how your feeling. As long as they’re loved and feel safe and get taken care of, you will truly have a friend for life. We added a new buddy to our brood! This is Juno. She is 5 years young, and has the happiest tail we have ever met. She was abused the first 4.5 years of her life, but through it all still remains trusting and loving. All she wants is a lap to snuggle on and someone to hold her paw. Fern is madly in love with her. We love her oh so much and can’t wait to make her life one that she loves. Dogs are of course known as man’s best friend for a reason. Many dogs perform a vital service as therapy dogs; their sweet nature proving to be profoundly therapeutic for those who have suffered a bereavement. Not only do therapy dogs provide comfort, they also help improve overall mental and physical health. Petting a therapy dog increases serotonin and dopamine levels in our brain, which improves our mood by lowering stress, anxiety, and depression. Petting a therapy dog also lowers blood pressure and helps those who are feeling lonely, which could be the case for someone who lost a loved one. Therapy dogs have the innate ability to sense a person’s emotional needs and act on them with unconditional love. Since those who are grieving may experience many of these emotions, therapy dogs make the perfect companion to help ease anxiety and confusion of death. It can simply be the therapy dog’s presence that distracts from stress and grief, even if for a moment or two. What did we humans ever do to deserve dogs? Gentle Dog Helps Little Girl Heal After Losing Her Dad. How Do Therapy Dogs Offer Comfort at Funeral Services?